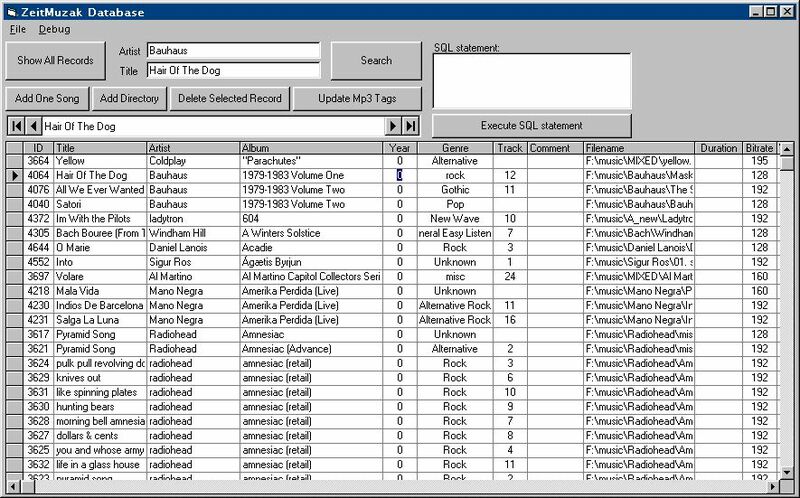 The zeitMuzak Database is a program that interact with a mp3 tag database. It can open any mp3 files and extract their ID3v1 or ID3v2 tags (song information) and add them to the database. The zeitMuzak Database is free software distributed under the GNU GPL. This program was created and designed under Windows 98 but also works under most Windows OS. If you find any bugs or you would like some more features, please drop me a mail. The Show All Records button will show all the records from the database in the Database Grid. The Add One Song button will add one mp3 file to the database. The Add Directory button will add all the mp3 files under one directory into the database. The Delete Selected Record button will delete the selected mp3 file from the database. The selected mp3 file is shown in the Data Field (the field on top of the Database Grid) and is indicated by the black arrow pointing to the corresponding record in the left column of the Database Grid. The Update Mp3 Tags button will edit the mp3 file(s) tag(s) to reflect the changes made in the Database Grid. The Search button will search and return the songs in the Database Grid that matches the Artist and/or the Title fields (left of the Search button). Partial names and wildcards(*) can also be used in the Artist and Title fields. The Data Field (located on top of the Database Grid) shows the song's title and indicate the selected record. The Database Grid (bottom part) shows all the records in the database or the result of a search. All the fields can be edited and their corresponding mp3 files can be updated accordingly with the Update Mp3 Tags button except for the Filename, Duration, Bitrate and VBR fields. An optional icon will be created on your DeskTop. That's it! Run the ZeitMuzakDB.exe file to launch the program.